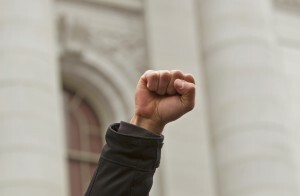 In this file photo, a union supporter raises his fist during protests at the state Capitol in opposition to Gov. Scott Walker's bill to eliminate collective bargaining rights for many public workers. Republicans are hurrying bills through the Wisconsin Legislature that they say could prevent layoffs by allowing companies to cut back workers' hours, but Democrats on Tuesday called them a renewed GOP attack on unions. The bills wouldn't require companies to negotiate with unions about cutting back hours, in contrast to almost all similar laws in other states. 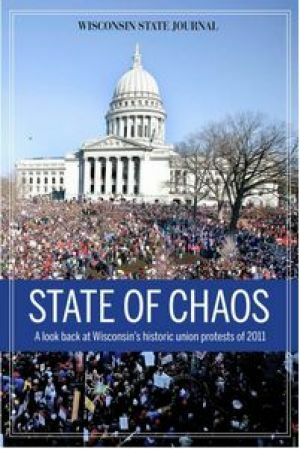 But a spokeswoman for the author of the Assembly version of the Wisconsin proposal said there was no intent to harm organized labor. "The idea is to help businesses limp through this very, very slow recovery," said Terri Griffiths, an aide to state Rep. Edward Brooks, R-Reedsburg. A hastily scheduled hearing was held in the Capitol on Tuesday, and committee votes could come as soon as Thursday, but Griffiths denied that the fast track was designed to skirt opposition. "At this point in time we're willing to expedite jobs-specific legislation," Griffiths said. Sen. Julie Lassa, D-Stevens Point, said the GOP was trying to sneak the law into the books before the public noticed. "It's one more step toward their goal of ending the right of Wisconsin citizens to have their voice heard in the workplace," Lassa said in a news release Tuesday. Griffiths noted that President Barack Obama is encouraging states to adopt work-sharing laws. But nationally, in all but one of the 24 states with work-sharing laws, union representatives must agree to the reduction in hours for their members, said Jeanne Mejeur, an analyst for the National Conference of State Legislatures. In 2011, the Republican majority passed Act 10, which all but repealed public sector union rights. "Republicans began their war on bargaining rights with Act 10, and with this bill they have now turned their attention to private sector unions," said Senate Minority Leader Chris Larson, D-Milwaukee. "This bill is a clear opening shot at undermining private sector unions." Under Assembly Bill 15 and Senate Bill 26, a company that lost a portion of its business could seek state approval to reduce workers' hours. A firm that lost 20 percent of its business could identify a group of affected workers and cut them back to four days a week, instead of laying off 20 percent of them, Griffiths said. Those whose hours were reduced could collect unemployment benefits to replace some of their lost wages, and benefits would not be affected, Griffiths said.